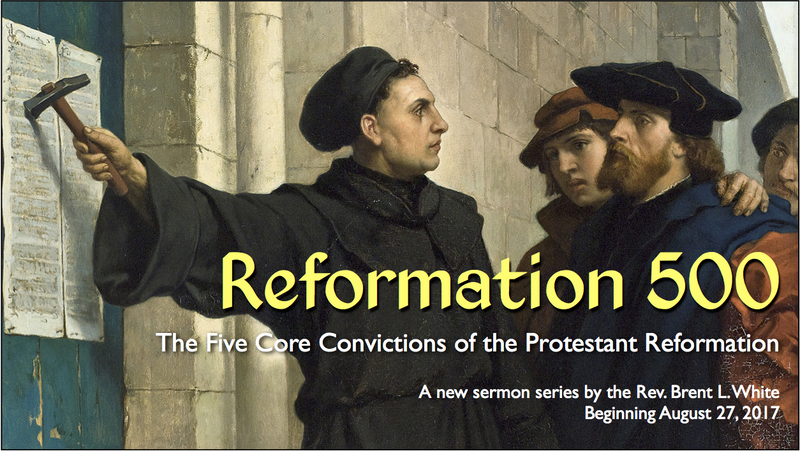 This sermon is the second of two on Sola Scriptura, the classic Protestant (and ancient church) doctrine that the Bible is the ultimate authority guiding Christian faith and practice. I contrast this doctrine with ideas put forward by Adam Hamilton in his recent book Making Sense of the Bible. From my perspective, Hamilton is misguided—dangerously so. As with my previous sermon, I hope to inspire confidence that the Bible is, as Wesley said, “infallibly true”—every word of it—and that we can built our lives on it. Paul begins today’s scripture with these words: “But as for you, continue in what you have learned and have firmly believed.” And what Timothy has learned, and what he has firmly believed, Paul says, is found in the “sacred writings,” our holy Bible. Remain there, Paul says. Remain in God’s Word. Don’t stray from its teaching. Don’t stop reading it, studying it, treasuring it. Don’t stop putting it at the center of your life. Aside from the gift of eternal life in his Son Jesus Christ, God has not given us a greater gift than the holy Bible. And of course, everything we know about Jesus Christ and God’s great love for us, and God’s plan to save us through faith in his Son comes from this book. Don’t leave it! Don’t think that you can progress beyond it. Or find something better. There’s enough in here for you, every day, to last a lifetime. Brothers and sisters, do you believe it? 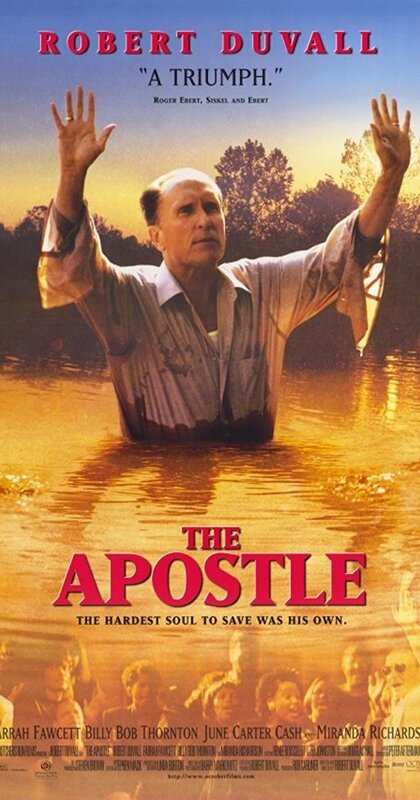 My second-favorite movie about Christian faith is a movie called The Apostle, starring Robert Duvall. It came out about twenty years ago. My first favorite is Chariots of Fire. You should see both of them. But The Apostle is wonderful: It’s about a deeply flawed but sincerely Christian pastor in the deep south. Someone gives him the deed to this tiny church in the middle of nowhere. And he starts preaching there, and slowly but surely more and more people start coming. But the they’re not the “right” kind of people—because most people in his congregation are black or Hispanic, and poor. And at least one person in town—a white supremacist played by Billy Bob Thornton—doesn’t like it at all. One Sunday, while the people at this church are worshiping, he shows up in a bulldozer. And he intends to literally tear the church down. And Robert Duvall comes outside and places his black leather-bound Bible in front of caterpillar tracks of the bulldozer—daring the man to run over it on his way to destroying this church. And Thornton is like, “Move the Bible.” “I’m not going to move it.” “Move that Bible.” “I’m not going to move it.” The two men are at an impasse. Is Thornton going to run over the preacher’s Bible? Then, after several tense moments, Thornton gets out of the cab of the vehicle in tears. Duvall embraces him. This sinner repents. Friends, I know most of us don’t own a bulldozer. And if we do, none of us is literally going to drive it over a Bible. None of us is going leave a Bible lying in the dirt. But let me ask you this: are you treating God’s Word in a way that’s consistent with what you say you believe about God’s Word? Are you treasuring it? Are you placing it at the center of your life? Are you remaining in it? Or have you strayed far away from it? Here’s a test: If someone were to observe us during the day, what would they say we treasure more: our Bible or our smartphone? Which do we believe—really believe—is more essential for our survival? My task as your pastor—to convince you that this Bible ought to be the most important possession in your life—is not made easier by our culture, which demeans the Bible, mocks the Bible, seeks to diminish the importance of the Bible, at nearly every turn—movies like The Apostle notwithstanding. 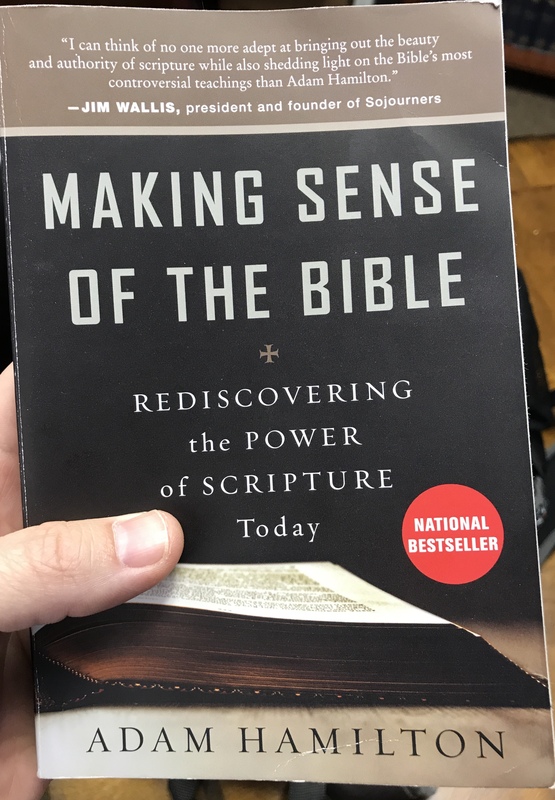 Therefore it breaks my heart that in his recent book Making Sense of the Bible, Adam Hamilton, our denomination’s most popular pastor, and one of its most gifted, is effectively contributing to this culture of disdain for God’s Word! Lest you think I’m exaggerating, consider this: In a chapter in his book, he discusses Paul’s words in verse 16: “All scripture is breathed out by God…” The ESV does an excellent job translating that Greek word, theopneustos. It literally means “breathed out by God.” If you look in our pew Bibles, you’ll see that the NRSV says “inspired by God.” It’s following the tradition of the King James. To say it’s “inspired,” though, would have meant more in the 17th century than it does today. Today we talk about “inspiration” like it’s an everyday thing: “That performance was inspired.” “She gave an inspirational speech.” If you look at the back of religious bestsellers, they will often be marked “inspirational” on the back cover. Our frequent use of the word suggests that being “inspired” is an everyday, run-of-the-mill event. And that’s not at all what Paul means. In fact, Paul’s use of the word “God-breathed,” theopneustos, is the first use that we find in ancient literature. Scholars say that Paul invented the word in order to say something uniquely powerful about what God has done through the Bible. How would you answer that question? I would answer it by saying, “Dear God, I hope so!” God forbid anyone think that the words of my sermon, however “inspired” they might sound, would ever be considered equivalent to God’s holy Word! So… the answer to both those questions is an emphatic yes! The words of scripture were inspired more than the words of any other “inspired” writing! It’s not even close! But Adam Hamilton says the answer is no. He writes, “The Spirit’s inspiration of the biblical authors was consistent with the way the Spirit inspires human beings today.” He goes on to say that the writings of C.S. Lewis are no less inspired than the Bible. I had a parishioner tell me one time that she was leaving the church. Among other things, she didn’t like my sermons. She said, “How can I put this tactfully? I don’t give a flip what C.S. Lewis says!” Because she thought I was quoting him too much in my sermons. Needless to say, I do give a flip what C.S. Lewis says. I love him and his books dearly. But I wouldn’t dare say that they were as inspired as the Bible! If he could come back from the dead, I can only imagine what he would say to someone like Adam Hamilton who compares his writing to the writing of holy scripture! Hamilton goes on to say that the Bible has more authority than C.S. Lewis or other Christian writing only because it is closer in time to the life of Jesus. I kid you not. He makes the analogy to our country’s Founding Fathers: Their writings about our nation are more authoritative than anyone writing today because they were there when the nation was founded. He’s saying that God did nothing unusual—God didn’t intervene in any special way—to inspire the Bible’s authors. This doesn’t mean that God dictated the words of scripture to its authors: he let them write in their own individual style, with their own personality, with their own idiosyncrasies, from their own point of view, from their own unique set of life circumstances. God was working through their words to communicate his Word. Isn’t this the way God usually works through us human beings? Most of the time, we’re not even aware of how God works through us—except we can often see God’s handiwork in retrospect. In his book, one argument of Hamilton’s is that the Bible couldn’t be uniquely inspired because, after all, most of its writers were unaware that they were writing scripture. Paul, for example, was writing letters to different churches and individuals to address specific concerns that they were facing. Whether that’s true or not—I think Paul knew that he was writing what the Lord wanted him to write, even if he never imagined that his letters would later become part of this collection we call the New Testament—but whether it’s true or not, it’s beside the point. God works supernaturally through people, whether they are aware of it or not! Paul communicates this truth in 1 Corinthians 15:10: In comparing his work as an apostle to the other apostles he writes, “I worked harder than any of them, though it was not I, but the grace of God that is with me.” So Paul was doing the work, but not so fast: It wasn’t him; it was the Holy Spirit who was doing it. How can both those things be true? Because it’s not either the Holy Spirit doing the work or Paul doing the work. It’s the Holy Spirit doing the work and Paul doing the work. And this is the way it is when it comes to the way that the Holy Spirit ensured that the words of merely human authors could also be the very words of God! Hamilton says that Paul didn’t use the word “God-breathed” to mean anything out of the ordinary, but how is that consistent with what Jesus himself says about the Bible? In the Sermon on the Mount, Jesus says, “For truly, I say to you, until heaven and earth pass away, not an iota, not a dot, will pass from the Law until all is accomplished. Therefore whoever relaxes one of the least of these commandments and teaches others to do the same will be called least in the kingdom of heaven…” I talked about Hamilton’s “three buckets” last week. Do you think that putting some of God’s law in Bucket Number Three, the way Hamilton does, and saying that some of God’s law was simply wrong and never reflected the will of God—do you think that’s “relaxing” the least of these commandments and teaching others to do the same? I can’t see how it’s not! Iotas and dots were very small marks within the Hebrew text of the Old Testament: every one of them is important, Jesus says, and everyone of them will be fulfilled. But notice this: He says that the One who created them male and female—God—is also the same One who said the words written in Genesis 2:24. Except when you go back and look at that verse, you see that God himself is not the one speaking in it: Literally, the narrator of Genesis says that the “two shall become one flesh.” Yet Jesus attributes these words not to the human author, who is technically doing the speaking, but to God himself. What does this mean? Jesus viewed these human words as the very words of God. Brothers and sisters, I’m just scratching the surface here; there’s so much more I could say. But I want you to be confident that when you read this precious and holy book, you are reading the very words of God—even though they were written by merely human beings. Not at all, and I personally have known or met scientists—professors at secular universities—who also believe that scripture is “infallibly true.” One of these is a chemistry professor at the University of Georgia, Henry Schaefer. He’s been nominated for a Nobel Prize. I met him when he spoke at Georgia Tech once. He pointed out that, according to surveys, scientists like himself attend church more often and in higher numbers than the population at large. The point is, scientists like him and many others have no problem believing in Genesis 1 and 2. Because they understand that those chapters are not intending to give us a modern, 21st-century, scientific account of how God created the universe. For one thing, such a description wouldn’t have made sense to anyone living three thousand years ago, and the God’s Word is for people of all times in all places. For another, science is constantly changing and revising its view of reality anyway. The Bible’s words are meant to be timeless. Not to mention there’s a lot of great work that’s been done to show that—actually—Genesis 1 and 2, when properly interpreted, are consistent with our best scientific knowledge. I could go on… But I’ll conclude with this. My life has never been the same. God’s Word, which the Bible says is “alive and active,” “sharper than any double-edged sword,” has changed my life. God’s Word is changing my life every day as I turn to it. 1. Adam Hamilton, Making Sense of the Bible (New York: HarperOne, 2014), 137. This entry was posted on	October 11, 2017 at 1:43 pm	and is filed under Uncategorized. Good sermon, as usual. My only note would be as to Genesis 1 & 2 versus the “scientific” view of how the universe, the world, plants, animals, and man came to be. As you note, the “scientific” claims tend to vary; I would suggest that they seem to do so about as frequently as there are years in a century (or maybe sometimes months!). I don’t think it’s appropriate to do so, either. William Lane Craig has a lengthy series of podcasts on different ways of interpreting Genesis 1-2 literally, i.e., the way its author intended it, and he agrees: we shouldn’t say, “Well, science says _this_, therefore the Bible must be wrong.” Too many people do that! From what I understand, Darwin has been proven wrong about nearly every aspect of his evolutionary theory. (Even if some form of evolution happened, contemporary biologists agree that it didn’t happen the way he described it. Thus they are “neo-Darwinists.” The old Darwinists were wrong.) In fact, I read that Gregor Mendel, the father of modern genetics, has been far more influential in the field of biology than Darwin. He’s been proven right! But you’ll never hear the Richard Dawkinses of the world heralding Mendel as their hero. Why? Because he was a Catholic monk! He doesn’t fit their narrative of Bad Old Religion vs. Good and Virtuous Science. I saw your post on Facebook. Can you explain briefly how carbon dating and the fossil record is consistent with this? I’m sincerely asking. I don’t know what the argument is. I’ve only become an evolution “skeptic” late in life. Forgive me. Oh, please! Can someone name ONE thing that we’ve learned about the human body that depends in any way on a belief in Darwinian macroevolution? You are correct, sir! Biology should not be focusing on hypothetical “origins” theories–what counts is how the body before you is constituted and works. You are correct, sir, again! That is exactly how it goes! I’ve admired you for arguing with scientists on this blog about it. It’s over my head. I haven’t studied it, literally, since ninth grade biology, and I’m sure that whatever scientists thought they knew about it back then has been seriously revised. And yet… the vast majority of people who believe in and defend evolution are just like me: they learned it in high school, and they’re “taking on faith” that their teachers and textbook writers knew what they were talking about back then. Meanwhile, they make fun of—who’s the Australian guy in Kentucky? Ken Ham. He may be wrong, for all I know, but I’m sure he knows a heckuva lot more about evolution than most of us! He’s studied it extensively. Right? And yet those of us who have a ninth-grade education on the subject are confident that he’s wrong. Isn’t that funny? Not just Ken Ham, but a lot of others with Ph.D. degrees in science, such as some of those at the Institute for Creation Research headquartered here in Texas. Right! Even in your debates on this blog years ago, you weren’t talking to people who were actual biologists, even if they were scientists. There’s this assumption that some abstract thing called “science” can speak with authority on questions of origins—because it speaks with authority on so many other things. So evolutionary biology steals credibility from the other branches of science in order to say, “How can you doubt us? After all, we put a man on the moon! Of course we’re right!” But putting a man on the moon, and the mathematical physics underneath it, has nothing to do with Darwinism. Absolutely! As one example, I sent my Oppositions to Evolution book (manuscript) to my old philosophy professor some time back, and his response was basically the same, “But look how much science has accomplished!” Just paint with a broad enough brush, and you can justify about any theory if pulled in under the title of “science” (I.e., proposed by somebody with some scientific degree). Yep. He should know better. Philosophy itself would tell us that there is no abstract thing called “Science” that can rule on the subject. I believe that creation was full and complete in God’s mind even before He initiated it. That includes the part of creation that’s still happening, and all of it until the creation comes to it’s end. God didn’t just create “the seven days” and sit back. He created the whole enchilada, from beginning to end, all at once. Time was a part of that creation, so “the story is still spinning out”. But, God knows it all, from beginning to end as we would say, because for God the beginning and end are all now. And, when God was “explaining” creation to Moses, he was telling it as a story that Moses could understand and explain to the Israelites. It is not meant as a scientific treatise. If God wanted to do that, even today, I doubt it would be comprehensible to most men. I agree with no “scientific treatise.” However, the question is whether the account is true “as far as it goes.” In other words, if God says, “7 days” (Note in Exodus that the justification given for the Ten Commandments’ Sabbath requirement is, “For in six days God created the world, and on the seventh day he rested.”), then “7 days” it is. And if God says, “I created this first, that next,” then so He did. The more science “learns”, the more questions it seems to raise. I agree with Tom that the “scientific explanation” is in a constant state of change. Also, the science of creation gets more and more complex in it’s data, strongly affirming the need for an incredible intelligence behind it. The mathematical perfection alone is mind boggling. But, Jesus said that we must be like children to see the Kingdom of Heaven. I think that includes a childlike wonder at the amazing creation we are a part of. Not stupid faith, but trusting faith. Amen to this beautiful sermon!